York Peppermint Cupcakes - Eat. Drink. Love. Hi Friends! Sorry I haven’t posted in a few days. Hubs and I are currently making our way from Florida all the way to California to spend Christmas with his family so my internet access has been quite limited. But, we stopped for the night to get some rest and I wanted to share these cupcakes with you guys. My brother, Mike, loves York Peppermint patties. My mom always keeps a bag hidden in the cupboard and her and Mike are always sneaking in to take one. It was Mikey’s birthday over the weekend and I wanted to make him a special treat. 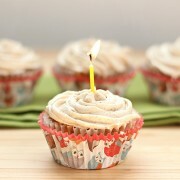 I have been wanting to give these cupcakes a try for some time and Mikey’s birthday was the perfect occasion! Mike seemed to enjoy the cupcakes and also said that these cupcakes were good because they also freshen your breath. So, there you go, dessert that also freshens your breath! Sounds good to me! 1. Preheat oven to 350 degrees. In a large mixing bowl, mix eggs, oil, sour cream, and vanilla extract. Add in cake mix and pudding mix and continue mixing until well-combined. 2. Place cupcake liners into muffin pan and pour batter into cups filling each cup approximately 1/4 of the way, then place a small york peppermint patty. Fill the liner with more batter until it is about 3/4 of the way full. Bake for 19-22 minutes or until a toothpick inserted comes out clean. Allow cupcakes to cool completely before frosting. 1. Cream the butter in a large mixing bowl. Add in confectioners’ sugar 1 cup at a time and continue until all sugar is creamed together with the butter. Add peppermint extract and 3 tablespoons of the milk or cream and mix. 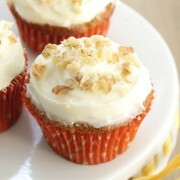 Keep adding a tablespoon of the milk or cream until your frosting is smooth. 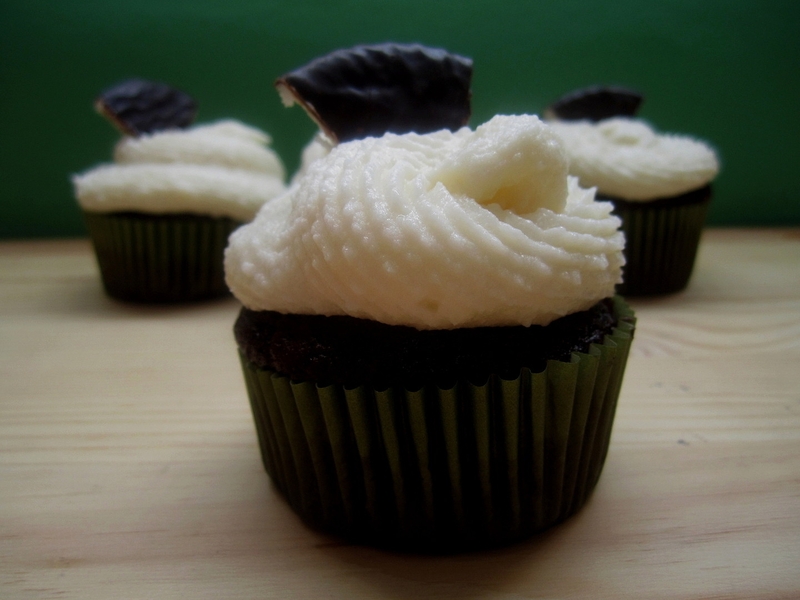 Frost the cupcakes and garnish with an additional mint or with shaved chocolate or sprinkles! – When baking with candy, I recommend freezing it overnight, otherwise, it will melt right into the batter while it’s baking! – If you can’t find the small-size Yorks in a bag, you can just buy the large ones and cut them up into smaller pieces! These are brilliant! Especially for someone who is a peppermint pattie fan! Not to mention they’re beautiful! Very nicely done! What fun to drive cross country. My husband and I have talked about doing that when we get back to the States. 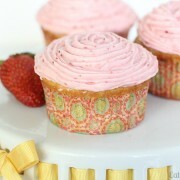 I love the cupcakes, you frosted them beautifully! Thanks, Alyssa! The hubs doesn’t like flying so he prefers to drive. I think it’s ok, we’ve done it a few times now, after the second day, I’m over it! Its stunning and yes, with peppermint I will drool all the more. Have a wonderful time and Merry Christmas to everyone and god bless. Till your next post, take care. How sweet of you to take time out from your travels to post this wonderful recipe. Peppermint patties do have a special place on my favorite’s list, so I am glad to see this yummy recipe. Stunning as well as delicious! Be safe on your journey and enjoy the holiday season, I wish you and your family the best. I look forward to seeing what delicious posts you have in store for us in 2012! Thank you, Tina! I hope you had a great holiday too! Oooh! These look fantastic! I love recipes that start with a shortcut like a cake mix :) Great post. I love peppermint patties – would love them even more in cupcake form. I also like using a cake mix sometimes – especially when you have so much other flavor like mint. Safe travels! Thanks, Becki. I’m all about the shortcuts, especially during the holidays! These look incredible! I’ve got to bookmark this one. My sis loves peppermint patties so this would be a great gift for her! I hope she likes them, Colleen! My daughter who was just peeking over my shoulder said mmmm, are you going to make those? She loves anything mint! Aw, you should give these a try then, Jen! Ooh, pretty. I love how they look with the piped frosting. Thanks! I still have a lot of piping practice to do! I would have to say that these are the perfect Holiday treat!! Thanks, Steph! They are pretty festive! I LOVE peppermint patties, these look and sound delicious!! Beautiful. The teeth comment at the end was pretty amusing! Not sure that should be the reason for eating them though. Great way to change a candy favorite into a baked treat. Yummy! I am a big fan of peppermint patties, so I’m sure I’d enjoy these cupcakes. Sadly I’m the only person in my family who likes the choco/mint combo… but I doubt that would stop me from making these for myself! My kids love York Peppermint Patties, too…so I’ll definitely bake these for them. And I always appreciate a cake mix short cut…especially during the holidays when time is scarce. Have a very Merry Christmas, my friend…and safe travels!!! I’m all about the shortcuts too! Hope you and your family had a wonderful Christmas! York Peppermint Patties are the best and these cupcakes look pretty good too! Thank you, Anne! I hope you had a wonderful Christmas too! I’ve never seen these before, but they look so good! Especially this time of year, peppermint is my favorite flavor :) I hope your travels went well and you had a wonderful holiday! What a great idea! I am really digging peppermint chocolate baked goods this holiday season and these would be a great addition to my sweet gluttony! 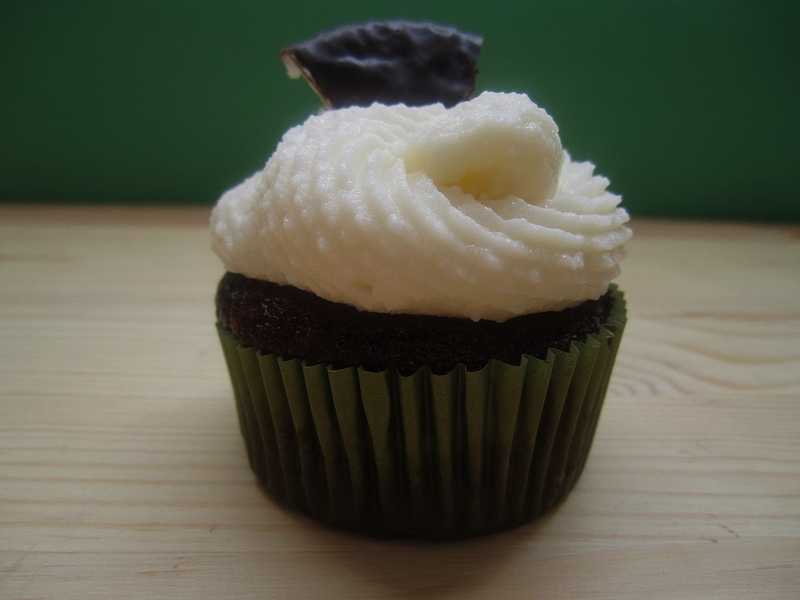 I love the peppermint patty hidden inside the cupcake, so fun! Happy Holidays Stephanie! These sound so good! York peppermint patties are so refreshing and they would be wonderful in a cupcake :)! Now I am craving one! Sounds heavenly :) I absolutely love york peppermint patties… Thanks for sharing! Where does the pudding mix go? The pudding mix goes in with the cake mix. I updated the instructions. Thanks!